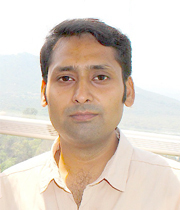 Ojaswa Sharma is an assistant professor at Indraprastha Institute of Information Technology (IIIT) Delhi. He completed his Ph.D. in Mathematics and Computer Science from the Technical University of Denmark, Denmark in 2010. He received his masters degree in Geomatics Engineering from the University of New Brunswick, Canada in 2006, and bachelors degree in Civil Engineering from the Indian Institute of Technology (IIT) at Roorkee, India in 2003. He has more than four years of experience with corporate R&D. His research spans various aspects of computer graphics, and computational geometry. In particular his work focuses on high performance computing on GPU, non-rigid shape deformation (in animation), feature extraction, and 3D surface reconstruction. Computer graphics and geometry with focus on Virtual and Mixed reality (VR/MR), volume rendering, 3D reconstruction, and high performance computing on GPU. Computer graphics, GPU computing, Virtual Reality.